American favorite ``Chopped'' heads north of the border to Canada with a familiar format and new host, Toronto native Dean McDermott, perhaps best known as being the husband of actress Tori Spelling and co-star of the ``Tori & Dean'' reality TV franchise. 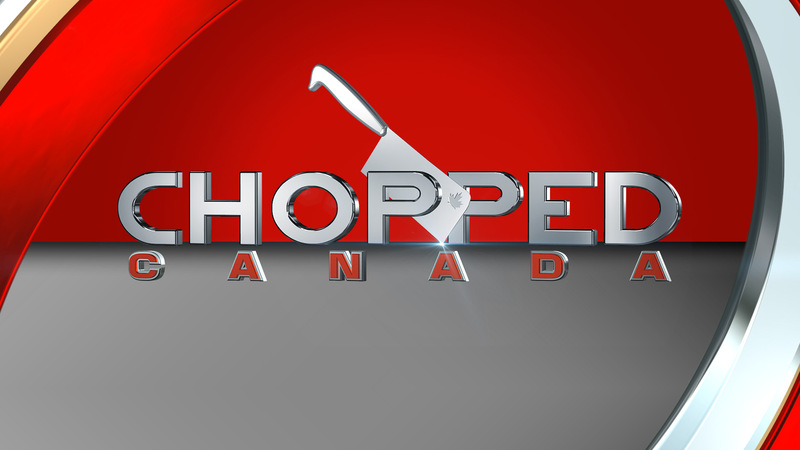 Each episode of ``Chopped Canada'' challenges four professional chefs to turn boxes of mystery ingredients into a three-course meal in a race against the clock. Each course serves as its own round in the competition, and the chef with the least-successful dish -- as determined by a panel of judges -- is eliminated after each round. 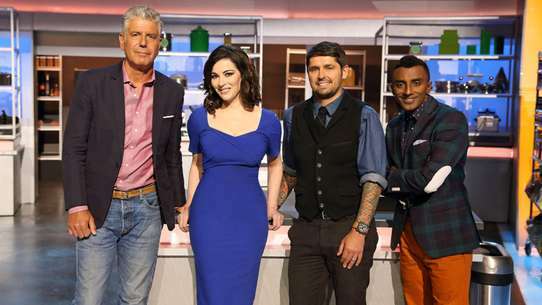 The chef who comes out on top following the dessert round wins $10,000 and the title of ``Chopped Canada'' champion. Chicken wieners and dried fruit in the first basket; brisket proves a tough meat to handle. Can an appetizer be made from smoke and sugar or will some spice make it nice? The chefs face leftover butter chicken in the entr&eacute;e basket and an injury takes its toll. Will slow and steady in the dessert round win the race? Four chefs stick their necks out when ostrich and lollipops make an appearance in the appetizer round. The entree makes for a wild time when chefs must mix a jiggly dessert with a gamey meat. It's a bit of a pickle for the two remaining chefs who must find a way to sneak a popular bar food into a prize winning dessert. 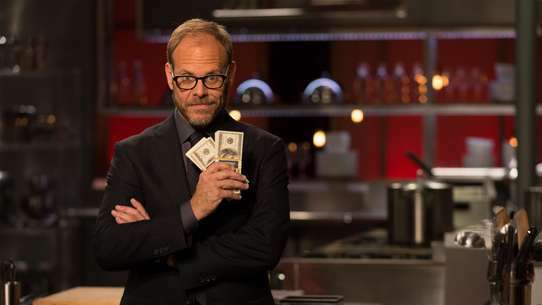 The chefs see red in the appetizer round when duck gizzards and sauerkraut are revealed. Everything but the kitchen sink is used in the entr&eacute;e round. Salt, sweet and sweaty hits the pots for dessert. #7 - Can You Stomach This? The chefs need to scuttle in the appetizer round. There&rsquo;s no silver lining in the entr&eacute;e round when tripe is found in the mystery basket. Will creativity turn sausages into a dessert worthy of winning. Four chefs race against the clock to transform yesterday&#39;s meals into a winning dish. Stale bread, a gingerbread house and a bottle of bubbly add to the struggle as each competitor rolls up their sleeves in this exciting leftover episode. #10 - Dippity Do What? A pre-packaged staple in the appetizer round; turducken in the entree round. Eggrolls and stilton cheese in the appetizer round; blood sausage and lemongrass are paired up. 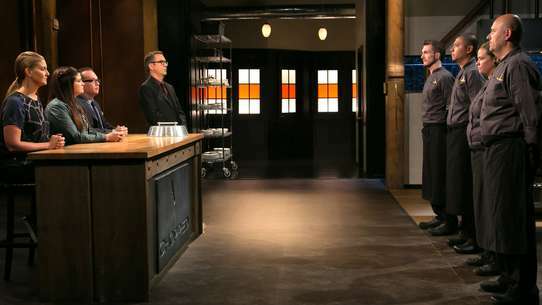 This candy filled episode pits Quebec chefs against Ontario chefs in a heated battle for Chopped Canada Champion. Black licorice and candy coated chocolates cause sweet struggles in the first two rounds, while a basket of woodsy and spicy flavors turns things upside down when it comes time for dessert. Four female chefs brave the baskets for a shot at the prize; salmon cakes abound in round one. One chef gets skewered by candy rolls and beef loin in the appetizer round. Chefs get a leg up in the dinner round. The dessert round poses a hot date with destiny for the remaining two chefs. A pork delicacy and a jarred delight jockey for position in the appetizer basket. Round two finds the chefs struggling with two Australian favourites in the entrée basket - sweet pavlova and spring lamb. A standard roast beef dinner accompaniment makes an appearance in the dessert round, confusing flavours even further with mint and pineapple. Frog legs and cookies; cherry cheesecake; paneer and elderflower liqueur in round three. #19 - Ramp It Up! It's do(nut) or die as the chefs ramp up for the first round. Octopus challenges the chefs to come up with three very different entrees, but ultimately, it's all about the pastry as the final chefs face off to create a dessert that will save them from the chopping block. #21 - How About Them Apples? Italian soda, Thai noodles and Indian spice garam masala; frozen French fries and tuna steak. Greek salad and beef pho in the appetizer round; a drive-thru staple in the second round. 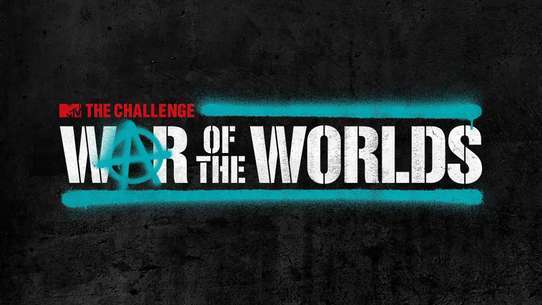 In a battle of the young versus the seasoned, four chefs face off to win the $10,000 prize. A strong appetizer round with escargot and onion rings leaves the judges wondering who should be chopped. Things heat up in the dinner round as one chef's rabbit is underdone and another's is cooked to a crisp. In the dessert round it's the duck that's laid the golden egg as one chef pulls ahead to win the race.